SFL678 is a high precision AC/DC offline PSR (Primary Side Regulation) controller for LED luminaries. The IC can provide very tight (less than 3%) constant current control (CC) ideal for LED lighting applications. SFL678 uses Pulse Frequency Modulation (PFM) control to improve efficiency and eases system EMI design. The IC dramatically lower system cost by eliminating secondary feedback circuits.The wide VDD operating range (10V to 30V, typical) of SFL678 can ease flexible LED system design. The IC also has built-in soft start function to soften the stress on the MOFET during power on period. SFL678 integrates functions and protections of Under Voltage Lockout (UVLO), VDD Over Voltage Protection (VDD OVP), LED Open/Short circuit protection,Soft start Control, cycle-by-cycle Current Limiting (OCP), pins Floating Protection, Gate Clamping, VDD Clamping. 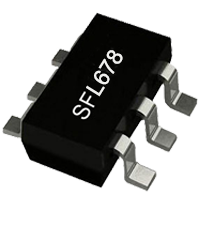 SFL678 is available in SOT23-6 packages.